I took 57 photos of this polish this afternoon. I usually take photos before work in the morning, but it was overcast as the sun came up so I couldn't do this holo justice. Now that it is daylight savings time here, at least I have an hour or two of sun after I get home now too. 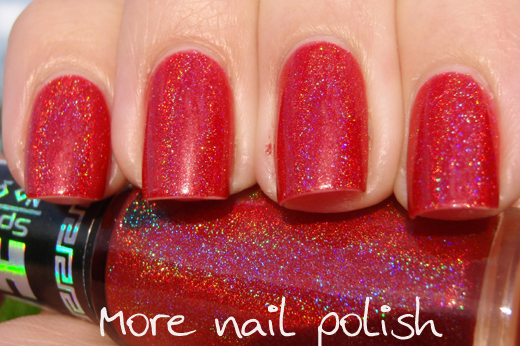 I've always had problems photographing red holos, I had the same problem with Ozotic 518! Anyway, imagine this being shinier and more holo, and just generally awesome in every sense. There was a while there a year or two ago when we were all saying 'I wish there was a true red holographic'. Slowing a few have appeared, Glitter Gal Red, Ozotic 518, BK 20 are a couple I know of. And now Hits Ares. 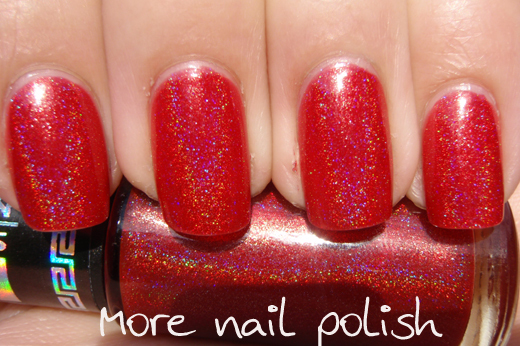 I only have Ozotic 518 to compare this to, but I actually think this is a different red. 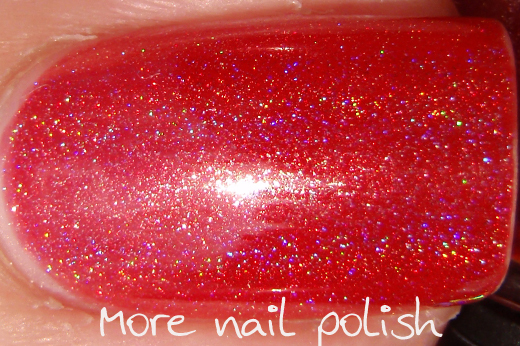 This seems to lean a more yellow red, not a pink red, which is really unusual for a red holo. It also has a slight metallic shimmer to it. Application again was perfect. I used three coats as I wanted it to have a glossy depth to it, and it looked amazing. I used Orly Bonder base coat and SV top coat. I actually caught myself looking at my nails twice today during a meeting at work. I don't usually get distracted by my nails anymore. There certainly was a time, when I first discovered holographic and multichrome polishes, where I would find myself staring at my nail at least 50 times during the day. But now I'm much more self controlled and use to my fancy nails. 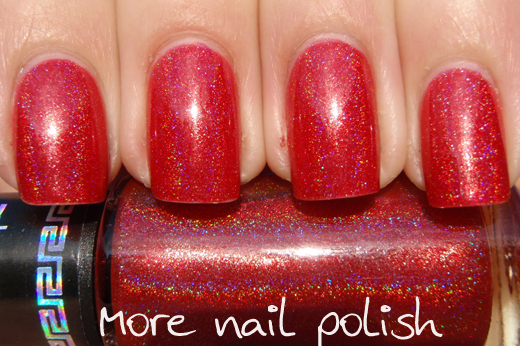 So, for me to be distracted by them must mean this is one special polish. The only bummer about these polishes is that they are tiny. They are only 6ml. 6ml of pure liquid perfection. I'm totally going to do some comparison swatches over the weekend. This against Ozotic 518 and Apolo against Glitter Gal Marine Blue and OPI DS Glamour. My mum also created a spectrafranken that looks very similar to Deméter, so I want to share that too. Over the weekend I will also be posting links to all the Colour Morphing Frankens and Spectrafrankens that you ladies have sent through. I'll also draw the winner of the three Picture Polish shades. Last change to email me your entries. Yeah I'm glad this is one I picked for the swap! So pretty. 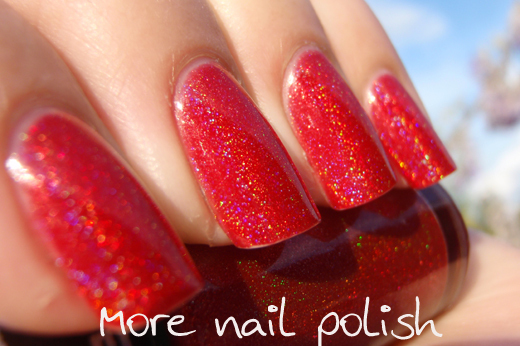 I can't tell you how badly I want these polishes! I've become enamored of the UV curing polishes now. I rarely polished my nails before because it was so much work and then I was lucky to make a full day before it chipped. Now I only wish Shellac and Gelish type polishes would come out with some holos!! I wonder if I could make a Spectrafranken with them?